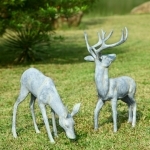 Deer Sculptures - Click on an item for more details! This exquisite "Time of Majesty" Deer Clock features brilliant colors combined with the natural beauty of wildlife and nature. A unique piece of artwork for your home or office that will truly be admired by all. A great gift for the deer or wildlife lover or even for yourself! 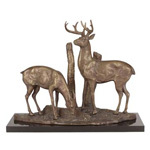 Height: 10.65"
This Sika Buck Head Sculpture is individually bronze plated. Meticulously crafted by hand ensuring this piece is of exceptionally fine detail as well as lasting durability. Designed to add beauty to your home or office. Also makes a great gift! Bronze Coated Polyresin 5 inches Wide x 9 inches Tall. This Buck and Fawn Sculpture is meticulously crafted by hand ensuring this piece is of exceptionally fine detail as well as lasting durability. Individually bronze plated and designed to add beauty to your home or office. Bronze Coated Polyresin 6 inches Wide x 7.5 inches Tall.